Benjamin Arie (Leib) Perlmuter in the Officers Prisoners Camp at Woldenberg 1939-? An article (originally in German) by Jan Jagielski, from the Jewish Institute in Warsaw, who received the documents about Benjamin Arie (Leib) Perlmuter from a Polish citizen who found it in an attic in Warsaw. It was published in the bulletin "Lebn wil ich" - Was bleib: Judische Friedhofe in Polen", editor Petra Blachetta Madajczyk, 31 august 1999". Translated from German by Ilana Witkowski and from Polish to English by Adam Neuman Nowicki and daughter Dr. Anat Halperin. Not long ago The Jewish Historical Institute in Warsaw received personal documents belonging to Benjamin Arie (Leib) Perlmuter who was the only Holocaust survivor from his entire family.
" I was born in Plock on March 22 1898. After I finished the Elementary School I entered the High School. Because of the outbreak of World War I school studies were interrupted. After a year and a half I was admitted to the fifth grade at the Malachonski High School in Plock. I received the high school diploma ("Matura") from this school in1919. In 1922, after serving in the army, I started architecture studies in the Warsaw University. In 1931 I became Architecture Engineer. I worked in a private architectural office until September 1939 when I was drafted to the army. After the defense of Warsaw I was taken by the Germans prisoner of war. I was released from the prisoners of war camp in June 1945." That was how he wrote in a laconic manner of the war times. He didn't write in which camp he was imprisoned and whether he had a family. A postcard sent from Warsaw on February 21st, 1942 gives us some more explanations. The postcard was sent by Aleksander Perlmuter (translators note: that was his small son's name) at the address: 63 Leszno Str. Apt. 24 Warszawia - this was in the Jewish ghetto in Warsaw. It was addressed to the "Polish Army Officer Benjamin Arie (Leib) Perlmuter at the address: Barak 12A Oflag in Oflag 11C in Woldenberg (presently Dobiegniew). Woldenberg was the biggest camp for Polish officers. The other side of the postcard served as a letter for relatives of war prisoners. It was required to write on this card only with a pencil and strictly on the lines. Thank you for your wishes. I miss you very much. Please send me a photograph because I already forgot how you look. I read books and I study. I kiss you. Oles." On the picture of a boy in a coat and hat taken in Zyrardow in August 1940 there is a dedication: "Oles, to dear father." Aleksander Oles Perlmuter perished in Holocaust with mother Roza. In a certain letter written by H. Piechocki from Zyrardow after the War, Feb. 17, 1946 we can read: "Respectful Mr. Engineer! I would be glad if you could visit me this coming Sunday. I was in contact with your wife and son until their last moment of stay in Zyrardow. I could tell you a lot about them." On the picture of a woman there is a dedication: "For remembrance to my dearest Pelka. July 1942"
On July 22, 1942 started the deportation from Warsaw ghetto to Treblinka. Perlmuter's papers also contain a poem written by Haim Nahman Bialik "Samotny" (translation: "Lonely"). The poem is full of despair and sorrow. It shows his profound depression in the post war years. The disease acquired in Woldenberg camp got worse. His papers contain also several letters from his friends in Palestine, discussing his health problems and eventual emigration to Palestine. In 1949 Perlmuter is admitted to a tuberculosis sanatorium in Otwock. At the same time he is working as a building engineer. He participated in rebuilding houses in Warsaw on Wiejska and Frascati streets. In 1950 he was responsible for building of the "Dom Slowa Polskiego" in Miedziana Str. All this time he contemplated immigrating to Israel. One of the main reasons for not leaving Poland was his life project of building a monument to the Jews of Plock who perished in the Holocaust, a symbolic grave to his dearest. Documentation of the rising monument on the Jewish cemetery, from its first plans until the actual unveiling is found in the Black Photograph Album. Among the documents are letters written between him and the head of the Jewish community in Plock, Mr. Alfred Blay. Among them there is a letter expressing sorrow for his failing health. Mr. Blay thanked him also in the name of the Jewish community for his hard work and dedication. In one of the last letters, Mr. Blay wrote to Engineer Perlmuter: "...On October 23rd of this year (1949) at 11:30 on the Jewish Cemetery an unveiling will take place of the monument dedicated to the memory of Plock Jews who were murdered during the Holocaust. The monument stands in the place where there are ashes of 25 murdered Plock Jews and is a symbol of the martyrology of all the Jews from Plock murdered by the Hitlerite perpetrators. This monument will be at the same time a commemoration for thousands of Jews who during many generations dedicated their life and work and tied their destiny with the town of Plock and died in this town...Even though the German murderers did not respect the resting place of our ancestors and tried to erase all trace of their existence, these letters engraved on this stone monument will be their everlasting testimony and tell of Jews from Plock to all generations to come. "In the unveiling participated the Jewish residents of Plock, Polish and Jewish delegations. Representing the Central Jewish committee was Director S. Fiszgrund. and present was Mr. Blay chairman of the Jewish committee of Plock, who was the main speaker and present was also the mayor of Plock Mr. Gizycki who unveiled the monument." "We are very sorry that you were not present at the unveiling of your work of art - The Plock Monument. Everybody liked it very much, especially the experts. How much work and effort you dedicated to the building of this monument. Every one of us Jewish brethren is proud of it. During my speech at the unveiling I stressed that we should all be grateful to you Engineer Architect Perlmuter, who always supported the Plock Jewish community and did not spare hard work and attention to this project and even during his illness helped us with his knowledge and art to fasten and achieve the goal. I allow myself at this moment to express my acknowledgement and gratitude as well as wishes of good health. I am sorry that your failing health did not allow you as the creator of this monument to participate in its unveiling. " Among Benjamin Arie (Leib) Perlmuter's documents there is an announcement of his death printed in the press: " Benjamin Arie (Leib) Perlmuter, Engineer Architect the Dom Slowa Polskiego, prisoner of Nazi camps awarded Krzyzem Zaslugi - the medal of Achievement - died on February 6, 1952 at the age of 54. The funeral will take place on February 7th 1952 at 15:00. The body will be transported from the funeral home at 49/51 Okopawa Str. Directors and employees of "Dom Slowa Polskiego". A photograph of this plaque was the last picture that Benjamin Arie (Leib) Perlmuter placed in his black photograph album for documentation of his creation, a monument serving as a grave for his murdered son, wife and other members of his family. In 1967 this monument was demolished by Poles. There are no more commemorating plaques and the present monument is a caricature of Benjamin Arie (Leib) Perlmuter's creation. Is it possible to change that? ! The Memorial Monument erected by Eng. Benjamin Arie (Leib) Perlmuter before vandalized by Anti-Semites in Plock. 1) Ilonka Neuman Nowicki nee Szechtman was the first cousin of Eng. Perelmutter. * Golda (Gucia) who married Adolf Rappell - mother of Ilonka - Dr. Anat Alperin's mother. *Myncia who married Jankiel Generson. 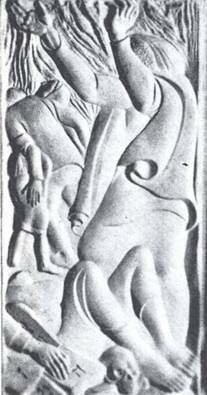 1) Fragment of the destroyed memorial, source: "Plotzk (Plock) a History of an Ancient Jewish Community in Poland, Eliahu Eisenberg, Tel Aviv 1967, page 299, see the jpg file in attachment. This appears in the article title: "Four Friends and their Spiritual World". It is about Benjamin Arie Lajb Perlmuter and three of his friends, Icchak Rubin, Cwi Hirsz Baran and Cwi Herman Kruk who founded a Yiddish newspaper in Plock after World war I, name: "Di Shvere Zeitung" - (the hard times). Perlmuter was a graduate of the Hebrew Gymnasium of Plock. One poem which survived from their newspaper is: "FARWOS?" Why?! It is about the sacrifice of young Jews who fight in foreign countries, for their foreign homelands, but their sacrifice is forgotten, and so the poet cries "WHY?!" 2) Eng. Benjamin Meirtchak, "Jews - Officers and enlisted Men in the Polish Army, Prisoners of war in German captivity 1939-1945", Tel Aviv 2003. Perlmuter Benjamin - son of Majer & Roza, born in Plock on 22.03.1898. Thank you for publishing the story. 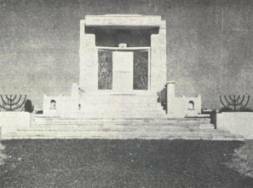 May be the memory of one son of Plock, his murdered wife and boy, and his destroyed monument erected after Holocaust in Plock, will be revived and kept and thus you do a real "Mitzvah" מצווה (great deed of virtue in Hebrew).